From mid-August to mid-September, I made a new trip to Southeast Asia. I visited several Bajau Laut communities in Indonesia, Malaysia and Philippines. In the beginning of the journey, Professor Erika Schagatay and I re-visited the villages Topa and Sampela outside the coast of southeast Sulawesi. Here, we continued to collect data on lung capacity, spleen size and other physiological characteristics of importance to a livelihood based on diving. During parts of the trip we were also joined by freelance journalist Sushma Subramanian who was making a story about our work in the field. We followed on several fishing trips, including speargun fishing and shallow water harvesting. In Sampela, many women collect shellfish, and they display great skills. They have an impressive knowledge about the sea life and can find sea shells well hidden under the sand. Many men are still making a living from speargun fishing even though fish size is reducing. However, on the last fishing trip one of the fishermen caught a large barracuda with help from his fellow fishermen. In April this year, we were reached by the news that not only Bajau divers, but also non-diving Bajau in central Sulawesi have naturally larger spleens than people in general. A Danish-American research group have found evidence for natural selection on the gene PDE10A which regulates spleen size, as well as for the gene BDKRB2 which is linked with the so-called diving response. The data was compared to a neighbouring sedentary group, the Saluan, which on average had much smaller spleens. The study was published in the article Physiological and Genetic Adaptations to Diving in Sea Nomads in Cell, and gave clear evidence for recent evolution for diving in the Bajau. After the article was published, questions regarding the findings in relation to the waterside theory have been raised: does the findings support or contradict the theory of an aquatic past in human evolution? If spleen size has grown recently in Bajau, and if we hypothesise that our distant forefathers were also diving, shouldn’t our forefathers have the same mutations on these genes? One explanation can be that genes coding for spleen size and certain diving reflex functions can change quickly over time and that specific genes have changed from pro-diving positions after humanity as a whole abandoned a semi-aquatic lifestyle, and then became more prominent again in the Bajau. This idea should be possible to falsify by looking at approximately 60 000-year-old DNA samples when nearly all humans still lived in the tropical zone. However, if we look at the evolutionary bigger picture the new findings do not contradict a past semi-aquatic lifestyle in humans. We have to take into consideration that humans overall have much larger spleens that for example chimpanzees and gorillas. Hence, even if Bajau have undergone a recent evolution in spleen size, it doesn’t mean that humanity doesn’t have a prerequisite for large spleens. Also, Erika’s and mine temporary data on spleen size among Bajau clearly shows that trained Bajau divers have much larger spleens than no Bajau divers. Hence, it is still obvious that regular diving is of great importance for spleen size. Further research on spleen size and larger genetic analysis should be carried out before relevant conclusions can be made. For example, it would be interesting to see if other Bajau groups in other parts of Indonesia have the same genetical adaptations to diving, not least since one study, The last sea nomads of the Indonesian archipelago: genomic origins and dispersal, showed that Bajau groups in Indonesia are often more closely related to neighbouring people than to other distant Bajau groups, since inter-marriages have been very common throughout the history among Indonesian Bajau. One study should also look at skilful female Bajau divers, since some Bajau women still are great divers, as for example in the village of Kabalutan in Togian, Sulawesi. It would also be interesting to take a close look at Bajau groups from for example Philippines and Malaysia, and perhaps especially those from northern Sulu and from islands and places such as Siasi, Basilan and Zamboanga. The great free diver Sulbin that walks on the seabed in a BBC:s series Human Planet was born in the island of Siasi in the Philippines. In Indonesia, it is still common that Bajau fishermen make longer fishing trips where they stay in their house boats for a couple of days or weeks. However, it is unclear if full time nomadic Bajau groups still exist in Indonesia. I was told by a Swiss traveller that she had encountered Bajau houseboats only two years ago in Sombori, just north of Lasolo in southeast Sulawesi which was one of the last strongholds for nomadic Bajau people. After my trip to Sampela, I decided to explore Somobri and Lasolo more closely to see if there are any nomadic Bajau left – or at least to get the chance to talk to Bajau people who only recently left their houseboats. I went to Saponda near Kendari and from there I followed four young Bajau men on a three-day trip to Lasolo and Sombori. First, we reached Labengki kecil where we visited a small Sama community but with no recent boat dwellers. The same day we reached the community Dongkala in Sombori, where we settled in the house of the Kepala Desa, the local chief. We walked to the outskirts of the village where there were some recently built houses, and one elderly woman told me that she had left her houseboat approximately only five years ago. However, she told me that there were no nomadic Bajau left in the region. Next day, we took a small trip around Sombori before we headed towards Lasolo, where we visited three traditional villages of former nomadic Bajau people: Pulau Meong, Toroh Gusoh and Marombo. However, they told me that there were no boat living people left and that many of the older “Bajau Soppe” had passed away. In Marombo, I met a healthy elderly man and I asked him if he still knew how to construct the traditional houseboats, and he told me that he and his brother in Toroh Gusoh still knew how to build them. However, it seems as that are no longer any nomadic Bajau left in this part of Sulawesi. After my trip to Indonesia, I headed to Semporna, Malaysia, where I met a documentary director from Hongkong who will make a documentary on the Bajau. During some intense days we visited the islands Bodgaya, Maiga, Denawan, Omadal and Mabul where we interviewed nomadic and sedentary Bajau Laut. We asked questions such as: do you prefer to live in a houseboat over a house? Do you want your children to go to school? Do you have national identity card? Do you recognize yourself as Malay? The documentary will focus on statelessness and how it affects them, and their day-to-day life. In the interviews, it was clear that most people in houseboats prefer to stay in the houseboat arguing that It is much easier to make a living from the boat than from the house. As a matter of fact, those who live in houseboats are often better off than those living in stilt houses. A houseboat is also much more expensive than a house. Many boat dwellers told us that they get land sick if they stay in a house; they are used of the never-ending flow of water under beneath them. They also told us that they are not interested in sending their kids to school, partly because they think that their children would get land sick but also because of that education is not for them. They rather learn from the sea than from the class room. Even many house-dwelling Bajau Laut said that they would prefer to live in a house boat if they could afford it, while others said that they now prefer to live in houses because they have become used to it. When we asked about their background, more or less all houseboat-dwelling Bajau Laut answered that they originally came from Tawi-Tawi. Many said that their forefathers came from the communities of Sanga Sanga and Tungbankao. However, in my last days in Semporna I also came across fully nomadic Bajau Laut just outside the community of Bangau Bangau who trace their roots to Sitangkai in southwestern Philippines. They were staying in smaller lepa lepa boats, while many Sama Dilaut Tawi-Tawi today live in bigger houseboats. They told me about their animistic rituals and beliefs, and that they once a year use to travel to Sitangkai on their houseboat to participate in the annual magpai baha’u ritual in which spiritual leaders (jinns) dance in trance to connect with the spirits. The community of Bangau Bangau which is largely made up by Bajau Laut from Sitangkai is very diverse. Here, some of the residents have their own cars and work in the town, while others still make week long fishing trips on traditional boats. A majority of its residents have national identity cards, unlike the Bajau Laut from Tawi-Tawi. Almost no houseboat dwelling Bajau Laut consider themselves as Muslims. However, a majority of the Bajau Laut in Bangau Bangau consider themselves Muslims even though they still hold on to many traditional beliefs. For them the “Sama religion” is a syncretism of animism and Islam, but for most Bajau Laut from Tawi-Tawi it is simply “Sama”. In total, there are more than 100 houseboats in the waters of Semporna. On Maiga, I could also see some new, big houseboats being built. Probably, the nomadic lifestyle will not come to an end in the coming years. Declining fish populations is of course a great threat to the livelihood of Bajau Laut as a whole, but those living in houseboats are more likely to be better off than those living in houses. In recent years, many Sama Dilaut whose forefathers remained in Tawi-Tawi and other Philippine islands during the turmoil in the 70’s and 80’s have started to migrate to Semporna because of the growing economy in the area. It is foremost the increase of Chinese tourists that attracts the increasing work force. The difference between Sama Dilaut Tawi-Tawi who remained in Philippines and those who arrived in Semporna in the last century is striking. In Philippines, the nomadic lifestyle has since long been abandoned and schooling have been common. Today, they have a different world view than their relatives in Semporna. I was told that many newcomers buy live fish from more traditional Sama Dilaut fishermen and sell it to Chinese tourists. For them a life on the houseboat is far-fetched and they are more open to education. As a matter of fact, the policy of the Malaysian government towards the Bajau Laut makes them traditional. No health care, no education, good security at sea and fear of deportation at land – all these factors contribute to keep them, or even make them more, “traditional”. Ethnicity is about expectations and negotiations; it is basically a result of the inter-relations between different people and the state. As a result, second cousins who grew up in Tawi-Tawi and Semporna might today have a different view on the Sama identity. In Indonesia, the approach from the state has been different. The Indonesian authorities have actively engaged in creating Bajau communities and integrated them in the larger political structure. Here, many Bajau Laut are proud Indonesians, and they are more integrated and less prejudiced than their Malaysian and Philippine relatives. In Sampela, which probably is one of the most traditional Sama communities in Indonesia, one man and his wife recently made Hajj. In the end of the trip, I re-visited the Bajau Laut community in Matina Aplaya, Davao, Philippines, where I first came in touch with the Sama. I spent a week in the community along with a Danish freelance photographer and free diver. The Bajau Laut in Davao belongs to a third group of traditionally boat living Sama people, the group from northern Sulu (Zamboanga, Basilan, Siasi and Jolo). Probably none of them are residing in houseboats today, but they are known to be great divers. This group is also the one mostly seen begging below ferries and in major Philippine cities such as Manila and Cebu. They have been displaced throughout the Philippines and also Sabah because of conflicts and a drastic decline in marine life in Sulu. In Davao, I followed some traditional fishermen speargun fishing in the gulf of Davao. Here, the most active divers still prefer to use the traditional goggles. I have made the same observation in Sampela: the most skilled and active divers are likely to keep the traditional goggles, even though they can afford a mask. They say that they are used of wearing the small goggles and that they feel uncomfortable with a big mask. The reason can be that they don’t need to use energy to equalize the mask. Another reason can be that the so-called diving response is more easily activated when smaller goggles are used. 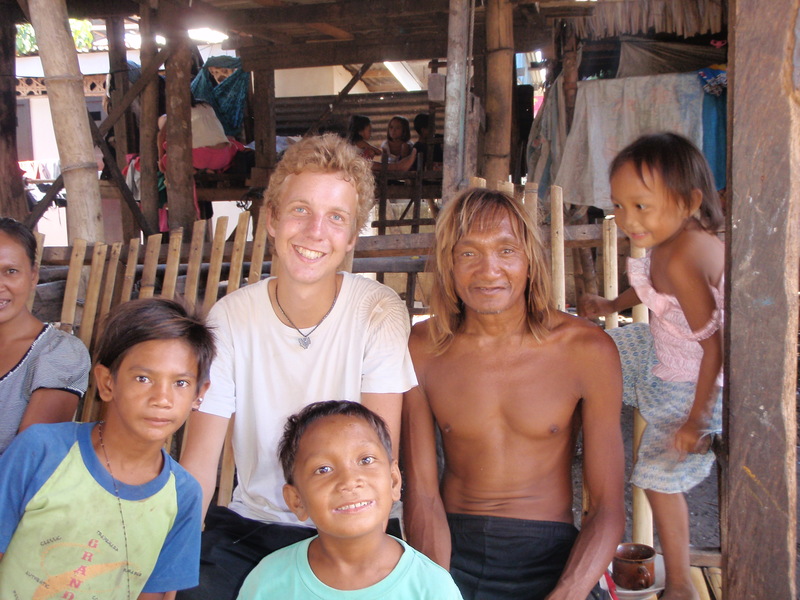 In Davao, I also visited a big Bajau Laut community in Isla Verde where many traidional Bajau Laut animists reside. However, only few Bajau in Davao do still rely mostly on fishing for making a living. Shoe vending and pearl vending are the most common professions in the area today. In mid-September, after more than 40 days of travelling, I returned home to Sweden. This entry was posted on November 20, 2018 by Erik Abrahamsson. It was filed under Uncategorized .